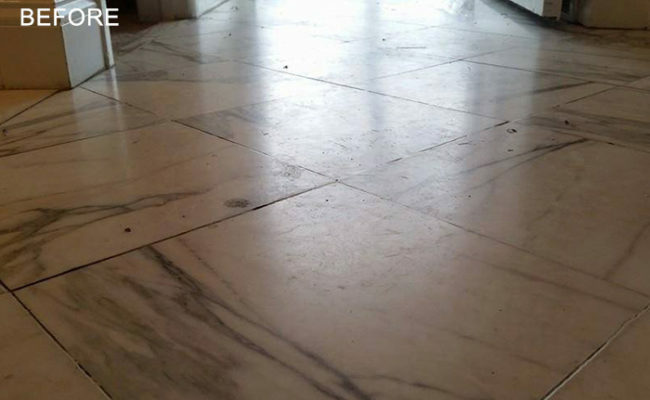 This marble floor in a Narberth, Pennsylvania home was in need of professional restoration, as you can see for yourself in the BEFORE image. The 150 sq. ft. floor in this Montgomery County home was 50 years old. The floor had lippage, which means that some of the tiles were higher or lower than others, and the marble surface had an overall dull, dirty-looking appearance. Our technicians aggressively sanded the floor (a.k.a. marble grinding) to remove the unevenness in the tiles and create a level, monolithic appearance. Then we honed and polished the floor to restore the factory finish. Our final step was to apply a penetrating sealer to inhibit staining. As you can see in the AFTER image, the appearance of the floor was dramatically improved. 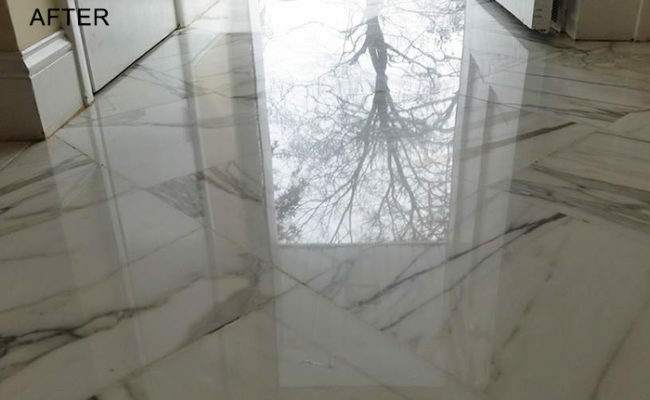 To learn more, visit our Marble Services page and watch our Marble Floor Polishing video. Do you have a floor that looks like the BEFORE image? We provide marble floor polishing services throughout the Philadelphia and Delaware Valley area. Use our online contact form or call (610) 356-4100 today for a FREE estimate.